We specialise in Hotels, Public Houses and restaurants, we use safe tried and tested products and techniques and solutions from leading companies Chemspec, Prochem and Alltec, to keep your carpets in 1st class condition. Allow us to schedule an office cleaning agenda to meet your firm´s needs. Let it be your business big or small we have the best possible cleaning package tailor made to you. Weather you have a wool carpet or man made mixed fibre carpets, cord or tiles we can assure you of a 1st class job. 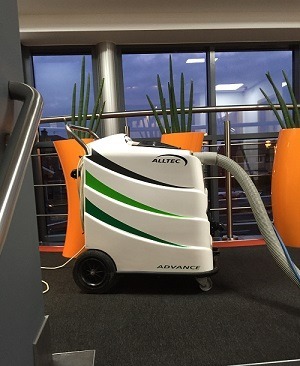 Our healthcare industry specific service offers micro fungal organisms neutralisation from hard surfaces in addition to carpet and upholstery. Urine Contamination Treatment will control urine odors from tile, concrete, wood floors, as well as other hard surfaces. It is an ideal product for the Nursing and Care Home industry. All commercial carpets receive high traffic usage, therefore need regular maintenance programme to keep them in the best possible condition, this helps promote your business and prolongs the life of your carpets so saving you money in replacing them.